The webcast showcased the mission of Tata Communications in boosting the overall job satisfaction of the employees by leveraging employee volunteering. Volunteering creates a win-win situation for People, Planet, and Businesses. Employees are demanding more purpose than pay-checks from their employers. Employee volunteering is seen as a potent way to engage employees who are always in search of purpose-driven work. The benefits of the employee volunteering program to your company and your employees can be many and varied- productive & engaged employees, staff retention, increased brand recognition, the enhanced reputation of the company, etc. While employee volunteering seems like an answer but engaging the key stakeholders, employees are a challenge. In this webcast Supriya Singh, Head- Corporate Social Responsibility, Tata Communications shared the case study of her organization, demonstrating how the employee volunteering program enhanced the overall job satisfaction of the employees, while simultaneously impacting the communities. 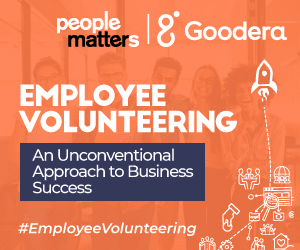 Supriya was joined by Aditya Nagpal, Business Head - Volunteering, Goodera who stressed on how employee volunteering can create a win-win situation for People, Planet, and Businesses. Make your employee volunteering program measurable, visible, and credible. Don’t implement employee volunteering because everyone is doing it. Do it because it means something to your organization and your people. Make employee volunteering consistent with or part of your corporate narrative. Document vision for the Employee Volunteering Program. Identify and include societal goals and outcomes that are to be targeted. Align them with the business goals of the company, industry, and sector. Identify the key stakeholders of the program - Leadership, Employees, Non-Profit Organizations, etc. Draft the protocols and rules for each stakeholder on their necessary code of conduct and share ideas as to how they can get involved. E.g., the guidelines for the employees will include ideas on how employees or teams can get involved, what rules they may have about service, tips on how to best represent the company during a service opportunity, etc. One function cannot own employee volunteering. You need to democratize the entire structure of the volunteering. Use technology to manage all the activities to streamline the volunteering efforts and track the impact. What works in one organization cannot work in another organization. Spend time in mobilizing and collectivizing the workforce. Acknowledge your employees by incentivizing them for their volunteering efforts. Did you miss the webinar? Don’t worry, we’ve got you covered. Watch the recording and start boosting employee happiness!